Popular musicians use their platform to release songs, videos, and statements that reveal, condemn, and inspire action in response to perceived social, political, and military injustices. Songs educate in ways classrooms cannot. Songs amplify the voices of those who have been silenced. Songs unite people around a common cause. Their words become collective cries expressing anger, despair, hope, and a desire for change. Think “We Shall Overcome.” Woody Guthrie’s “This Land is Your Land.” Billie Holiday’s “Strange Fruit.” Marvin Gaye’s “What’s Going On.” Beyonce’s “Formation” video and performance at Super Bowl 50. Protest songs exist within a complex system of power, cultures, values, politics, entertainment, and texts. 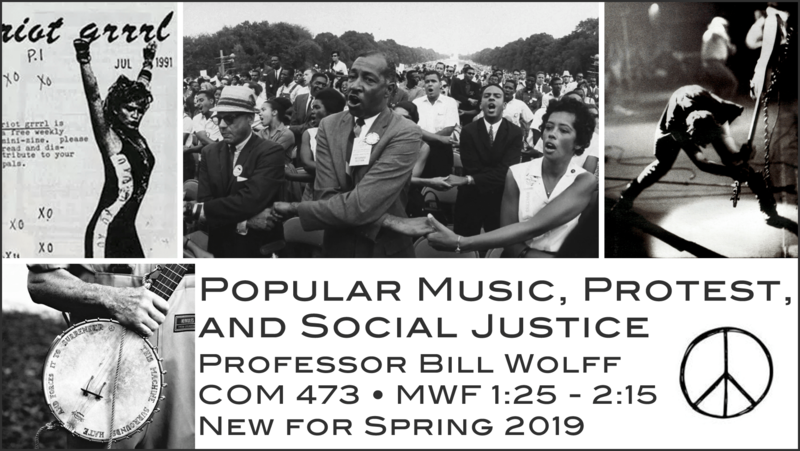 In this course, we will consider that complex system by analyzing protest songs that cover important issues, including race, civil rights, war, labor, and immigration, from Slave Spirituals to the Civil Rights Movement; anti-war and pro-labor folk movements of the 1960s and 70s to punk rock of the late 1970s and Riot Grrrl in 1990s; rap and hip-hop in the late 80s and early 90s to the anti-war movement in the early 2000s; and artists, like Childish Gambino, Rihanna, Lady Gaga, Bruce Springsteen, and others. In doing so, we will see how protest music fights power, encourages activism, and, perhaps, affects change. I’m excited to be teaching a new COM Options Course in Spring 2018, “Social Media and Participatory Culture.” It meets T/TH 2:00 – 3:15. In Social Media and Participatory Culture, we will consider how people have used social media to subvert civil and corporate institutions and protest against perceived injustices. We will see how those same institutions have tried to leverage social media to engage in surveillance and manipulation. And we will see how people are using participatory culture to persist against those attempts. We begin in the 1980s and 90s with fanzines and remix/mashup culture, specifically looking at, for example, the feminist punk zine, Riot grrrl, “which called for the liberation of young women . . . [and] to revivify feminism . . . [in] direct response to the dominance of straight while men in the punk scene” (Darms, 2013, p. 1). We then move through the supposedly idyllic first years of the web and Web 2.0 to look at how people were participating with the hope of building community. From there, we come to our present social media moment, dominated by Twitter and Facebook. On Twitter, we will analyze protest hashtags and subnetworks, like Black Twitter, that call attention to and fight injustice. On Facebook, we will look at the proliferation of fake news, which is designed to confuse, deceive, and manipulate. We will consider the implications of our current moment where bots swarm social media feeds and our data can be used against us. In doing so, we will critically examine how social media platforms, such as Twitter and Facebook, afford (and encourage) certain user behaviors through their interface architecture, algorithms, and advertising systems. Though the course has a significant theoretical component, we will engage directly in participatory practices by creating our own subversive media objects (such as, zines, mashups, archives, and bots)—the whole time considering how those objects exist within a powerful media ecology that extends from our creative spaces to corporate servers to the halls of Congress. A week after the 2016 Presidential Election, my department got together in an emergency meeting to discuss a possible response to the events on our campus and across the country. Here is our response. I am so proud to be a member of this department and have such fine colleagues committed to social justice. First, let me apologize for emailing you at your work account. I searched for some time for a Delaware County GOP-related email, but was not able to find one. I am writing as a Delaware County resident. My wife and 2 sons (3 and 6 years old) live in Nether Providence. Ever since the election, we have lived in a state of increasing dread and fear—fear for what will happen to our country with Donald Trump as President. Please know that this has nothing to do with party; though I am a life-long Democrat, I did not fear for the sake of our Democracy when Bush was elected twice, nor do I fear for the state of PA, in general, when Republicans are elected. Donald Trump is, however, a completely different story—as I’m sure you know. The foreign policies he is thinking of enacting and the people with whom he is surrounding himself are an affront to the decency of the republic. His behavior since the election has shown him to be vitally unprepared for the presidency, disinterested in national security briefings, and only interested in furthering what is best for himself. The fact that he reached out to one business to convince them to keep jobs in the US seems to go against the very core of free market conservatism—and is doubly problematic since he owns shares in the Carrier parent company. The fact that he has called and talked with foreign leaders on a private cell phone without briefing or oversight is absolutely frightening. The fact that he invited his daughter into a meeting with the leader of Japan is breath-taking in its utter contempt for ethical practices. Further, his praise of Putin, his call to weaken NATO, his disregard for necessary political protocols, put us, as Americas, is real danger. In a recent article in the Daily Local News, you are quoted as saying, “No one has advanced an argument yet that would overcome the argument that I should vote the will of the people.” Your county, Delaware County, voted overwhelmingly for Hillary Clinton: 59.60% to 37.18%. Hillary Clinton has over 2.5 million more votes than Trump nationally. When you state, “the will of the people,” which people’s will do you have in mind? The people of your county? The majority of people who voted for Clinton nationally? Or, the fewer than 100,000 people (a number that is shrinking by the day) who voted for Trump in 3 states that handed him the Electoral College? Nothing was more to be desired than that every practicable obstacle should be opposed to cabal, intrigue, and corruption. These most deadly adversaries of republican government might naturally have been expected to make their approaches from more than one querter, but chiefly from the desire in foreign powers to gain an improper ascendant in our councils. How could they better gratify this, than by raising a creature of their own to the chief magistracy of the Union? But the [constitutional] convention have guarded against all danger of this sort, with the most provident and judicious attention. The Electoral College was initially created to guard against candidates who may have been co-opted by foreign governments or are dangerous to the continued existence of the republic. Even beyond your statement that you would abide by “the will of the people,” Donald Trump is the exact kind of man that Hamilton and the other members of the constitutional convention had in mind when creating the Electoral College. There is the very real possibility that Russia influenced the outcome of this election and, indeed, colluded with Trump. His business ties oversees (and large debts to Chinese and Russian banks) make him susceptible to foreign interference. You have an awesome responsibility, sir. The next 50 – 100 years of American policies, freedoms, and place in the world will be decided in your vote on December 19. We have moved beyond party to a place where the future of our Republic is at stake. I strongly encourage you to uphold the traditional intentions of the Electoral College and the will of the people of Delaware County by not voting for Donald Trump.